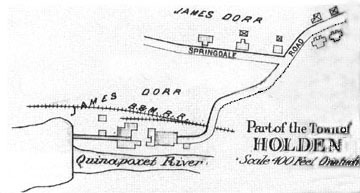 A mile and a half west of the trailhead of the Mass Central Rail Trail (MCRT) in Oakdale (part of West Boylston), MA, snug between the Quinapoxet River and the trail in the Springdale area of Holden, you’ll find the remaining stone foundations of the Springdale Mill. Once a thriving woolen mill located at the end of Springdale Road, the site also includes the remains of a mill-workers’ village. The mill began in 1864 with the construction of an 85-foot dam across the Quinapoxet River. The dam was built to create a millpond that would provide a reservoir of water to power the mill, and was later extended to 115 feet. In 1865 the Springdale Mill, built of wood and containing two sets of machinery, opened for business under the ownership of a Mr. J.L. Smith. During these early years the railroad did not yet run past the mill, so its goods were carried to market by horse-drawn wagons up Springdale Road. The life of the original mill building was short; in 1875, it was destroyed by fire. Under the new ownership of J.G. Smith, the mill was quickly rebuilt and was soon back in full operation. This time it was built from granite quarried near the site, and contained four sets of machinery. By 1879, the mill manufactured 250,000 yards of fancy cassimeres (closely woven twill wool, usually used for men’s suits), and employed over 35 people – a large percentage of the adult population of Springdale. Many of these workers were probably transient, living in the mill village in cramped communal housing called tenements. 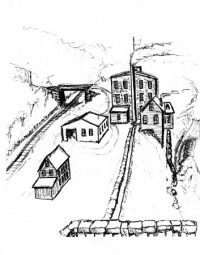 In 1882, the Mass Central Railroad opened between Oakdale and Jefferson, providing a more efficient means of transporting the goods manufactured by the mill. A railroad siding was built next to the mill, and a bridge was added over the track to connect the mill directly to Springdale Road (the bridge abutments are still visible from the trail). A passenger station was opened at mile marker 43 of the railroad (43 miles from the start of the railroad in Boston). In 1892 James Dorr bought the mill, renovated it to manufacture satinets (fabric made from silk and wool), and renamed it the Glen Woolen Mills. The mill continued to thrive, and by 1895 the population of Springdale reached 143. But the mill would not continue to operate much longer. With the building of the Wachusett Reservoir, the Metropolitan Water and Sewerage Board (a predecessor of the MA Department of Conservation and Recreation (DCR) bought the mill on November 24, 1905, to safeguard the water quality of the reservoir. A year later the Commonwealth destroyed the dam and razed the buildings. The Commonwealth paid $80,000 for the mill and village, which at the time of purchase included the four-story main mill building, two stock houses, a dye house and picker house, five buildings for housing mill employees, two barns, and numerous outbuildings. A one-room schoolhouse located at the end of Springdale Road was not razed, still stands on Manning Street. With the closing of the mill, and the earlier closing of the Canada Mill further up-river, the population of Springdale dwindled to 112, and the area has never again seen industrial development. Today most of the foundations of the mill and village buildings remain, but they are succumbing to the ravages of time. Fortunately, the process of stabilizing and recovering these foundations has already begun, with the aim of letting these old stones tell the 42-year story of the vibrant and dynamic world of the mill between 1864 and 1906. As one recent visitor to the site exclaimed, “You can almost feel the ghosts!” Soon, all will be able to remember and enjoy this little piece of our local history. 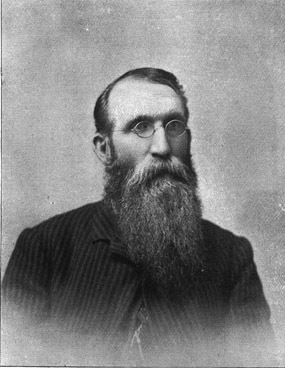 Sources: The History of Holden by D. Estes contained the basic information, and all other published histories, such as Prouty, and Zook, are based on his account. Recent research by Anthony Costello (as part of his work on the history of Holden mills), Chuck Skillings (as part of his work as Curator of the Holden Historical Society), and John Kovich (former DCR Head Ranger), have all added to our knowledge, as have materials and maps from the History Room of Holden’s Gale Free Library. We have also relied on material from the American Textile Museum in Lowell, MA. The Saga of Lost Railroads, The Central Mass. The Mass Central and other railroad sources were used, as was The Springdale News, published between 1958 and 1966 by George Dresser and his brothers.